Self-Care is an important aspect of any healing journey. You can eat all the kale you want and exercise every single day and still not see the results you seek because you are not practicing self-care. A great teacher of mine, Jessica Drummond once called self-care “Cashmere Blanket Therapy”. This is a fantastic way to think about self-care. Cozied up in a cashmere blanket with a cup of tea and a good book sounds so soothing to the soul. But self-care doesn’t have to mean just this. And the possibilities for progress are endless! I started my self-care journey as a teenager, when my parents got divorced. The mother of my boyfriend at the time suggested I try some yoga. From that time on I was hooked. Although sometimes it was hard to get on the mat, and my relationship with yoga has been a rocky one for the past decade, I would not be where I am today without it. Currently, I still practice yoga and also dabble in meditation. I can’t explain my excitement for a blah rainy day where I can relax, read a good book and rest. But sometimes our we don’t have time for a day of relaxation (although very highly recommended!!). 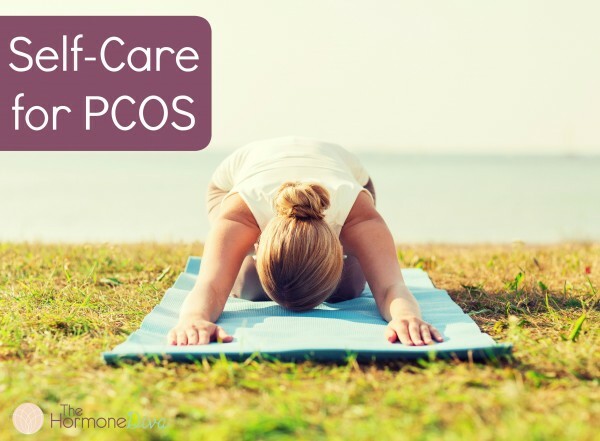 The following are a few examples of self-care activities very useful in helping women with PCOS. All of these suggestions are activities I participate it regularly. I’ve already mentioned some awesome benefits of yoga as exercise for PCOS. It’s also important to note that yoga is a self-care activity. Yoga not only gets us to move our bodies, but it also forces us to slow down and literally take a breath. Breath work and the mind-body connection has big importance in yoga and big benefits for our bodies. When I say meditation most women freak out. Some think it’s religious or spiritual in a way they’re not comfortable with, but often women are so unused to “doing nothing” that the thought of “wasting time” sitting and breathing for awhile seems silly. Not so, my lovely friends! Learning to breathe properly in every day life and during those “do nothing” times will probably have a greater impact than any other one thing you can try for self-care. I highly recommend practicing some sort of deep breathing every single day. Even if it’s for a couple of minutes before bed. Three-Part Breath: this exercise is particularly helpful for insomnia, and receiving anxiety, especially the type coming on before menses or during menopause. Using scent such as those in essential oils is known as aromatherapy. Essential oils have been used for centuries around the world to help heal a variety of health conditions or issues. I started my foray into essential oils with a small bottle of lavender essential oil. I put a few drops on my pillow at night or in a soothing bath. Soon my collection grew, and do did my uses. I have successfully used essential oils to reduce cold/flu symptoms, to ease pain, to stimulate circulation among others. Essential oils can be used in a variety of ways that will benefit women with PCOS. Here is a piece of that “Cashmere Blanket Therapy” I mentioned earlier. Having a soothing cup of tea can be invigorating, relaxing or restorative to the body and soul. Herbal teas can be used successfully to help almost any ailment with PCOS. I use a CRAMP tea before my period to ease my pain. The last on this not nearly exhaustive list of self-care activities, affirmations are exceptionally powerful. I’ve got affirmations posted up everywhere around my bedroom, bathroom and office space. Affirmations are quick to read, but make lasting impact when you repeat and see them regularly. By regularly I mean daily, like- every time you pass one, say it out loud to yourself. Below are a few of my favourite PCOS affirmations. You can find more affirmations for specific ailments in this awesome book by Louise Hay. Acne: I am a Divine expression of life. I love and accept myself where I am right now. Anxiety: I love and approve of myself and I trust the process of life. I am safe. Ovarian Cysts: I am balanced in my creative flow. The movies of my mind are beautiful because I choose to make them so. I love me. Click to Tweet! Menstrual Problems: I accept my full power as a woman and accept all my bodily processes as normal and natural. I love and approve of myself. Painful Periods: (Dysmenorrhea) I love my body. I love myself. I love all my cycles. All is well. Weight: I am at peace with my own feelings. I am safe where I am. I create my own security. I love and approve of myself. PMS: I now take charge of my mind and my life. I am a powerful, dynamic woman! Every part of my body functions perfectly. I love me. Click to Tweet! Hirsutism: I am a loving parent to myself. I am covered with love and approval. It is safe for me to show who I am. Blood Sugar Balance: I now choose to make my life light and easy and joyful. Include one or more of these activities in your life every single day. Take 1-5 minutes for affirmations, or 5-10 minutes for deep breathing. You’ll never regret doing 30 minutes of yoga followed by a soothing cup of herbal tea. Schedule it in and make daily self-care a lasting habit.